Late Victorian onwards. The desk and chair are joined together by two runners. The desk has an ink well and a groove runs alongside to hold pens in place. The lid opens and is well used with graffiti and ink blots in evidence. Victorian onwards. The teacher’s desk was high so the teacher could see all his pupils without having to stand. It also elevated his position in the eyes of the children. There were two inkwells, one red and one blue, in the top of the desk. The base of the desk was a cupboard where books could be stored. The hand bell was kept on top of the desk and the cane was always on show on a hook at the side of the desk. Victorian onwards. The blackboard was the main teaching aid for the teacher. They were set on free-standing easels to enable them to be positioned where needed. The height of the black board could be adjusted by pegs. 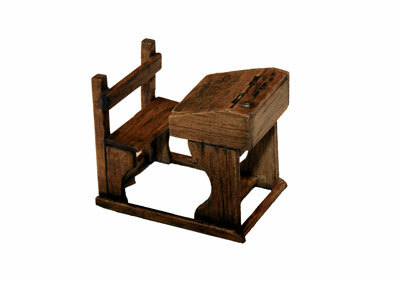 The teacher’s chair was a basic chair with long legs so that it could fit behind the tall teacher’s desk. Victorian onwards. The large abacus or ball-frame, as they were sometimes known, was used by the teacher at the front of the class for counting lessons and arithmetic. The traditional school stove was a common feature in classrooms from the Victorian times to the middle of the 20th century.